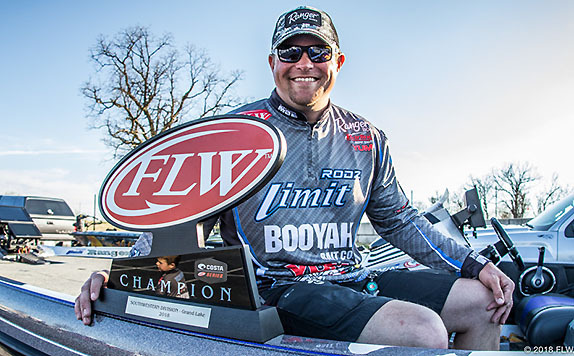 Chris Jones caught 17 1/2 pounds on each of the last 2 days en route to winning the Grand Lake Southwestern FLW Series. Chris Jones thought he'd blown his shot at winning last week's Grand Lake Southwestern FLW Series in Oklahoma when he returned to the launch on opening day with a bag that was one fish short of a limit. 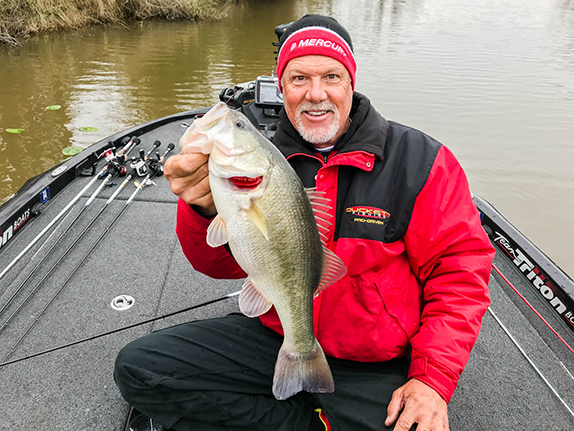 However, that 12-pound stringer was bested by fewer than 20 anglers in the field of 169 competitors and his 17 1/2-pound hauls on the next 2 days were enough to give him the victory. 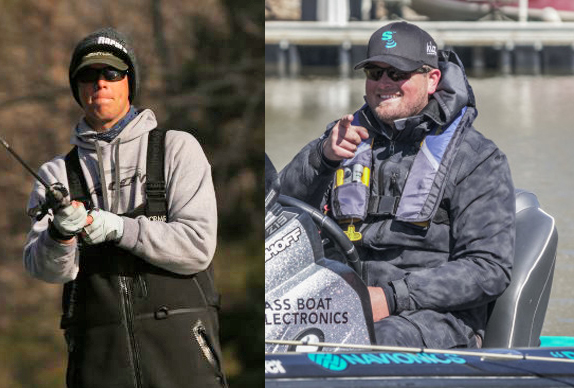 The Bokoshe, Okla. resident, who competed in the 2014 Bassmaster Classic after winning the previous year's Arkansas River Central Open, actually finished tied with FLW Tour pro Jeff Sprague at Grand with a 3-day total of 47-03. Jones was declared the winner on the basis of a higher placement in the day-2 standings � Jones had been 4th and Sprague 5th. The 38-year-old Jones, who works as a computer numerically controlled (CNC) programmer for a machine shop, hopes to use his latest triumph as a springboard to competing on the Tour next year. Also, with only the derby at Fort Gibson Lake remaining, he'll try to hold off Sprague for the Southwestern points title � Jones currently has a 5-point edge, with a 16-point gap between them and 3rd-place Colby Miller. "I was invited (to compete on the Tour) the year before last, but I couldn't do it," he said. "I really hope I can do it this time and I will if I can pick up a couple of sponsors. My wife has been hounding me to do it." Jones said he fished Grand last week in much the same way that good friend Jason Christie had en route to a runner-up finish in the 2016 Classic. However, he avoided the Honey Creek area that Christie had exploited 2 years earlier. "It was getting way too much pressure," he said. "Jason showed everybody what was in there and every time I went by there were a bunch of boats in there. I knew I had to go somewhere else." He stayed in the mid-lake region and threw a spinnerbait to docks that weren't too attractive on first glance. Fish were using them as staging areas before fully committing to the spawn. "I call it ugly stuff. It was one dock here and one there and it was stuff that most people would pass up." His action improved as the tournament progressed. He got only the four bites on day 1, then 12 on day 2 and 15 on the final day. A single dock gave him 6-pounders on both the second and third days. He regretted not fishing it on day 1 � he never made it that far down the lake. "I fished almost totally clean � I only lost one fish in 3 days pulling them over cables and stuff and I caught a couple of fish that I really shouldn't have. They were fish that (break off) 90 percent of the time." He tossed his spinnerbait to the rear corners of the docks and parallel with the cables in 1 to 4 feet of water. Many of his key bites came from beneath the cables and under the walkways. "They were all on the back ends of the docks. I didn't even cast to the front of them � that was just wasting time." > Spinnerbait gear � 7'2" medium-heavy Limit Custom rod, Bass Pro Shops Johnny Morris Signature Platinum casting reel (6.8:1 ratio), 20-pound Bass Pro Shops XPS fluorocarbon line, 1/2-ounce Booyah spinnerbait (white/chartreuse with single No. 5 blade), 3.5" YUM Pulse swimbait trailer (white or pearl). > He used the pearl trailer in stained water and white in muddy water. > He picked up two weigh-in fish on a YUM Flash Mob Jr. umbrella rig with 1/8-ounce VMC jigheads and 4.5" YUM Pulse trailers (shad). 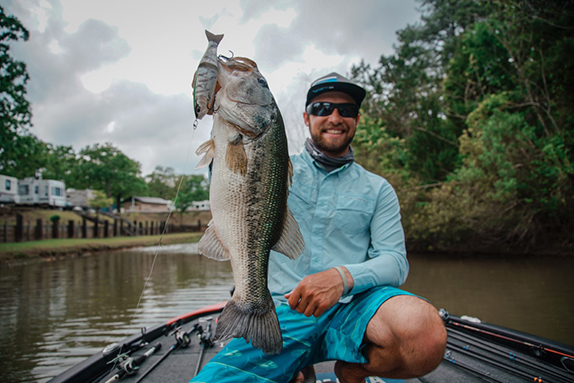 > He caught a 3 1/2-pounder on day 1 on a vibrating jig that he skipped far underneath a dock. > Main factor in his success � "Everything went right. If anything had malfunctioned at all, I wouldn't have won. I have to give credit where credit is due and that's to my equipment." > Performance edge � "My Garmin electronics. I fished 10 or 15 new places every day and the color shading on them is so perfect that I could run down the lake and they'd show me right where I needed to go." Nothing went as planned on day 1 of the Grand Lake FLW Series for Jeff Sprague. The fish weren�t as aggressive as he hoped they�d be. He wanted the water to warm up. He didn�t connect on numerous bites and the end result was two fish for 6-15 and sole possession of 61st spot. �I absolutely just executed poorly,� he said. �The fish weren�t ready to do what I wanted to them to do. I had ample fish hooked up, but couldn�t get them in the boat. He transitioned to a vibrating jig on day 2 in the same areas and it translated to a tournament-best 22-02 stringer that pushed him up to 5th. He followed that up with 18-02 to pull even with Jones. He fished in the Elk River as well as the lower end of the lake, where he targeted pockets with warmer water. Water temperatures had been 53 to 55 degrees, but warmed up to 58 to 60 by day 3. He said docks, especially those with brush were key because the fish would stage and suspend in the brush piles. When the wind shifted out of the north on the final day, he switched to a spinnerbait and crankbait. > Reaction bait gear: 7� medium-heavy MHX 843 casting rod, unnamed casting reel, 15-pound P-Line Tactical fluorocarbon line, 3/8-oz. prototype 6th Sense Jigsaw vibrating jig (glittery perch pattern), 6th Sense Crush 200 crankbait (shad).